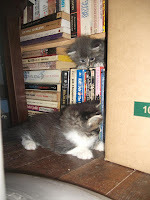 The picture shows cats playing atop some books -- cats on books, literally speaking. But that's not what I mean. This is about cats and the books they like. 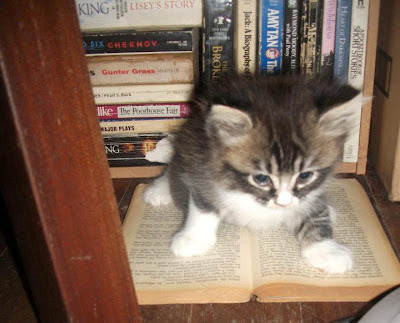 It's common knowledge among dynamic pet breeders that cats adore books and start to read as early as two weeks old, when they open their eyes. 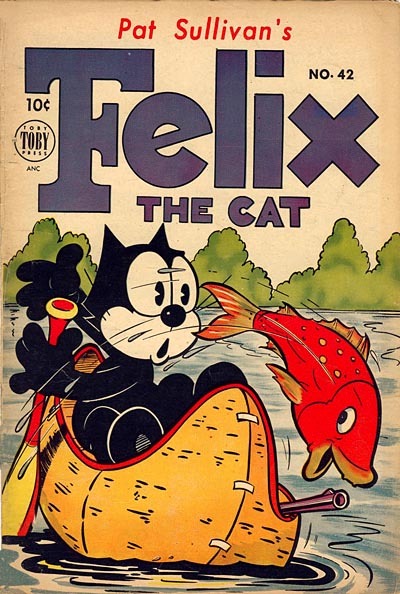 In their kittengarten stage they start with kiddie fare like Dr. Seuss's A Cat in the Hat, then move on to Saki's Tobermory, though not one of them likes what happened to the only member of their species that had gained the ability to talk. It is not unusual to find some of the more sedate kitties preferring T.S. 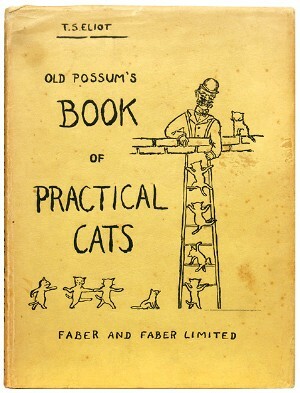 Eliot's juvenile Old Possum's Book of Practical Cats, from which the smash Broadway play, Cats, was adapted. I have even seen kittens, in private moments, humming the theme song, Memory. One of them even extended his reading to Eliot's The Love Song of J. Alfred Prufrock. This poem has nothing to do with anything feline, but cats do like the somber sway and tenor of the poem. Kittens have a deep fondness for specialized magazines about them: Cat's World, Kittens, Cat Fancy, and occasional articles in National Geographic about their favorite country in this planet, Egypt. They venerate their ancient ancestors who lived in luxurious palaces with pharaohs who really knew how to give cats their rightful place -- way up in the pantheon of nobility. Would you believe songs by Cat Stevens are still extremely disliked by erudite and musical cats? They hiss at Morning Has Broken, yowls greet Wild World, tuffs of fur are tossed against the composer of Father and Son. Kittens and old cats have on record the sin of the erstwhile-adored Cat Stevens, talented singer turned idiotic Islamic convert, who with great cacophony supported the crazy Ayatollah Khomeini's fatwa against prolific writer Salman Rushdie. For writing The Satanic Verses, Rushdie had been sentenced to death by whatever means in the hands of any Muslim who succeeds in making Rushdie shake hands with his creator, asap.